The Toronto Maple Leafs slipped to their seventh loss in their last 10 games with a 4-2 defeat to the Arizona Coyotes on Sunday night. 1. The lack of desperation in the Leafs game is apparent right now. Let’s start on the defensive side of things, where there are too many examples of late where they’ve been too soft and disengaged during this recent stretch. The Clayton Keller goal where Morgan Rielly wasn’t urgent enough/hard enough on the puck reminded me a lot of the Carl Soderberg goal Jake Gardiner was at fault for, the Mikko Rantanen goal that Nazem Kadri was at fault for, and the Mitch Marner turnover on the 3-2 Coyotes goal — Leafs players who know better were in a position to make a play on the puck and were just plain outworked. Tonight’s game winner by Vinnie Hinostroza was similar to the game-winning goal by Soderberg in the loss to Colorado— a lot of standing around and puck watching as the Leafs got outworked around the net/below the goal line. There are too many soft plays happening out there and not enough desperation and urgency in the Leafs’ game at the moment. 2. Offensively, in these last three losses to struggling opposition — vs. COL, FLA, and tonight vs. ARI — have not been good enough from the standpoint of generating enough high-quality scoring chances. 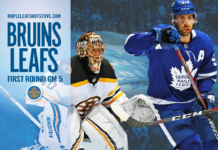 Opponents have adjusted as the season has progressed and are not giving the Leafs much off the rush. For their part, the Leafs are not simplifying, throwing pucks to the net, getting to the hard areas of the ice, and making it hard on the opposition goaltender on a consistent enough basis. All three of those teams entered the game in bad shape as far as their recent form and they all played more desperate hockey than the Leafs as far as protecting the critical areas of the ice and blocking shots. 3. Tonight, as far as high-danger chances go, the Leafs generated six through 40 minutes to the Coyotes’ seven. They generated six more in the third as they pushed to tie the game up, but that’s not enough over two periods against a bad Coyotes team. Against Florida and Colorado, they generated just three high-danger chances at 5v5 all game. Not good enough. 4. The question is: Why doesn’t the head coach see it the same way? Mike Babcock was right about the Leafs having the puck a lot in this game — they owned over 60% of the shot attempts — but I’m guessing when he does his rewatch of the game tape, he’ll come away less impressed with the scoring chance count he references as the coaching staff’s most valued performance metric. This is about more than just puck luck right now. The Leafs aren’t making their own breaks. They’re getting outworked. 5. The power play remains a farce — 1 for its last 19, and just 13.2% (24th) since December 1. It went to work just once tonight, but the sum total of the power play was a Marner seam slap pass that was jammed up and a Marner slap shot with a clear view for Darcy Kuemper, who held on for a whistle. It’s time for the Leafs to run it through Matthews and move Tavares out of the net front role — he had 30 points on the power play last season with New York and has two PP points in his last 22 — for a while. We’re reaching the definition of insanity here. 6. Tough break with the Andreas Johnsson injury. Trevor Moore has been missed since he went down, but ideally, he wouldn’t replace one of the players that’s been playing with some jam and competing pretty well for the most part. 7. I haven’t been able to kick the feeling of deja vu throughout this recent string of subpar performances from the Leafs in the month of January. It turns out it’s because this same thing happened between December 29 and January 22 of last year. This season, the Leafs are 3-7 in that time. Last season, they went 3-8, albeit with four losses in overtime (two of those wins also came in the shootout). If you remember back to last January, the Leafs power play was really slipping. 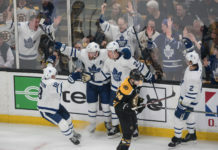 Their stars were experiencing a collective slump — Matthews had six points in 10 games to lead the team, followed by Gardiner, Rielly and Nylander with five each. JVR and Marner had three points in 10 games, while Kadri and Marleau had two points in 10. 8. It led to some pretty big shakeups in the lineup, spelling the permanent end of the JVR – Bozak – Marner line. It birthed the Marleau – Kadri – Marner combination, with Marner then going on a huge tear for the rest of the season (37 points in 36 games to end the year). It spelled the end of Matt Martin’s time as a lineup regular and Frederik Gauthier was returned to the Marlies eventually. Up came Kasperi Kapanen and eventually Andreas Johnsson, who both gave the Leafs a really nice shot in the arm down the stretch. 9. This time around, the Leafs don’t have those types of moves readily available to them. Trevor Moore arguably deserves to be with the Leafs right now — and will be, at least while Johnsson is out — and someone like Mason Marchment might be getting close, but they don’t have two players as ready to make an impact right away as Johnsson and Kapanen were last season. They don’t have the ability to take two players out of the lineup as they did with 2017-18 Gauthier and Martin Martin and improve on them drastically as soon as tomorrow just with a couple of callups. By and large, this forward group is what it is right now, but what it is should be an improvement over last season, accounting for the maturation of the core and the addition of John Tavares. The issue is, for whatever reason, there just isn’t a lot of cohesion or clicking combinations at the moment, despite the improved talent level overall. 10. It’s getting difficult to kick the sense that the current mix isn’t quite right. The Leafs won’t be a 3-7-0 team in their next 10 — there is a close to zero chance of that happening with this team’s talent level. The PP will figure it out in time also. But faith in the team’s ability to bounce back in the regular season doesn’t change the nagging sense that something is missing here if this team is going to contend when faced with the toughest divisional playoff path in hockey. The Micheal Ferland addition is a nice thought and would help a good deal, in my opinion, but it’s probably not just a one-player-fixes-all situation. It’s a couple of players — a right-handed puck mover, at least one more forward with the right mix of skill and jam, likely two — that are going to be needed to alter the makeup enough to get this team where it needs to go.